The Sweater Babe free pattern of the month might not be one you want to knit right now, but I’ll bet you’ll want to download it and keep it for knitting when the weather starts to get cool again. The Falling Leaves Pull-Through Scarf is a shaped scarf with leaves on both ends, and a pull-through notch so the scarf stays secure around your neck. 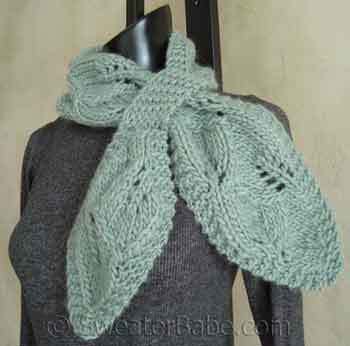 It’s sure to keep you both warm and looking good throughout the winter months, and the bulky yarn makes it a pretty quick project, too. You might want to keep this one on hand for holiday gift knitting. This download is available through June 30, 2014. It’s not my pattern but if you’re having problems you should contact her. Thanks!